There's been some confusion regarding Dead Space 2 DLC on the PC, with EA claiming that it has no plans to release extra content for the platform despite it being present in the game at release. We dug deeper, and this is what we found. 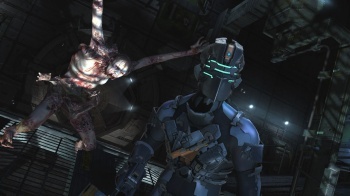 A bit of background to bring everyone up to speed: when Dead Space 2 launched on January 25, EA announced that Severed, a new chapter in the Dead Space story, would be released as DLC for the Xbox 360 and PlayStation 3, but not the PC. An EA rep confirmed with us via email that Severed would not be available for the PC. Fair enough; it's not the first time that PC gamers have found themselves on the short end of the DLC stick. Shortly thereafter, EA also released three DLC packs containing new suits and weapons, the Supernova Pack, Hazard Pack and Martial Law Pack, that were also console exclusives. But then something unexpected happened. An enterprising individual discovered that the code for the three DLC packs was already present in the PC version of the game and put out an edited save game that unlocked all of them at no charge. We again contacted EA and were told, again, that "EA has no news about PC DLC at this time." It seemed a bit odd, given that the DLC was already in the wild. PC Gamer made a point of noting our report that the DLC would not be released for the PC, so we picked up the trail once more to find out once and for all what was going on. And we were, to put it bluntly, stonewalled. "It was not intentional and we don't have any plans for DLC content on the PC" is all we could get from EA; beyond that, the company refused to comment. So where does that leave us? It's hard to imagine that EA would include the code for the DLC packs in the PC release without a plan to release them at some point in the future, yet its insistence otherwise suggests that as baffling as the idea is, maybe that was actually the case. Otherwise, EA's plan was simply spoiled by an impatient and industrious gamer, and it is now engaged in the most stunningly ham-fisted damage control possible. Either way, it's nothing short of a debacle. We'll continue to stay on top of the situation and update if and when EA decides that its protests are futile. In the meantime, unfortunately, there's little else to say except that despite what it may have planned, those DLC packs are out there. Pretending otherwise is not going to make them go away.